The last day of our tour was not quite as action-packed, but was still very special. 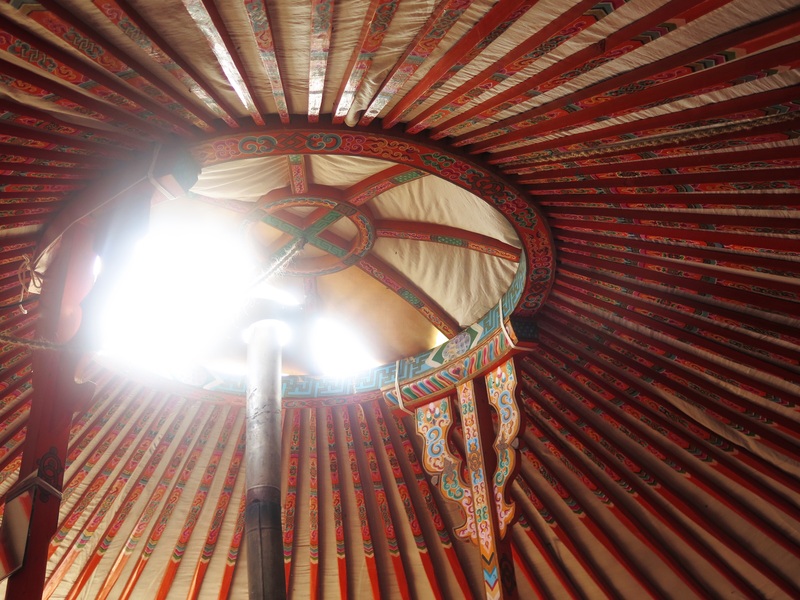 We started a bit late because we went back to Erdene Zuu to hear the monks chant, and that didn’t start until 11:00. 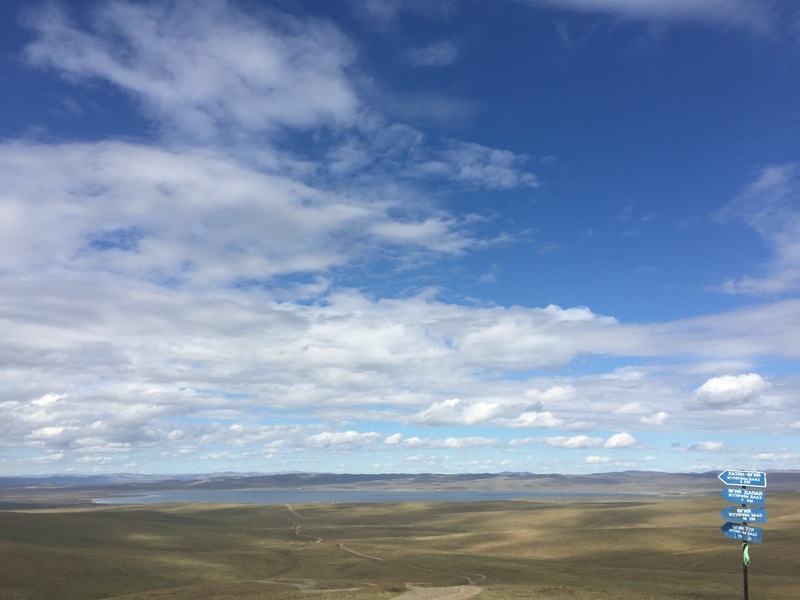 Our next stop–and the last stop before our return to Ulaanbaatar–would be Lake Ogii, which is one of the biggest lakes in Mongolia and has lots of fish and birds. We would stop here, hopefully at the home of some nomads Meg knows, and have lunch. Looking down on Lake Ogii from the top of a hill. This was another place where I knew the photo would never do justice to the landscape. Meg wasn’t sure if the nomads would still be there, though, since they’re nomads. They move about four time a year, seeking fresher pasture and different weather conditions. In the fall, they move into the mountains, where they’re more sheltered from the wind. Unfortunately for us, the families Meg knew were all gone already. So we kept driving, hoping to come across some other family. 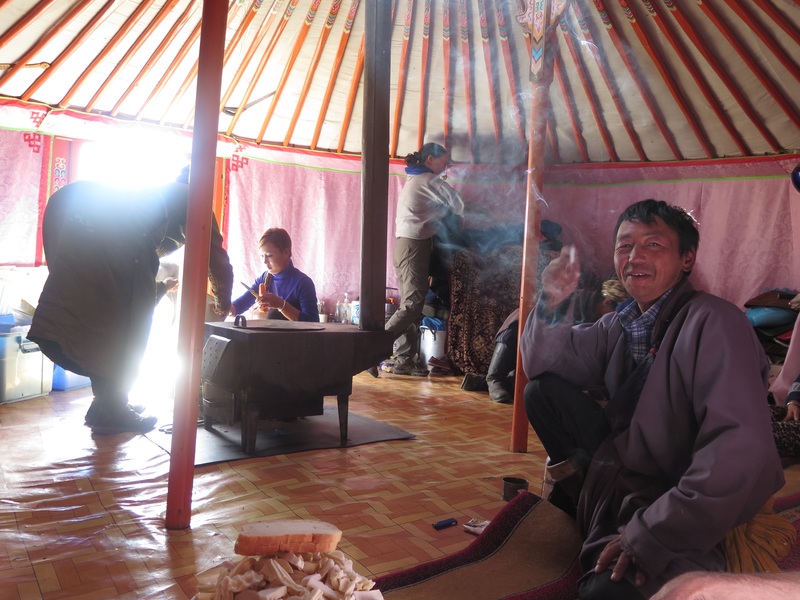 Steve and I talked about this later, and about the difference between American and Mongolian hospitality. 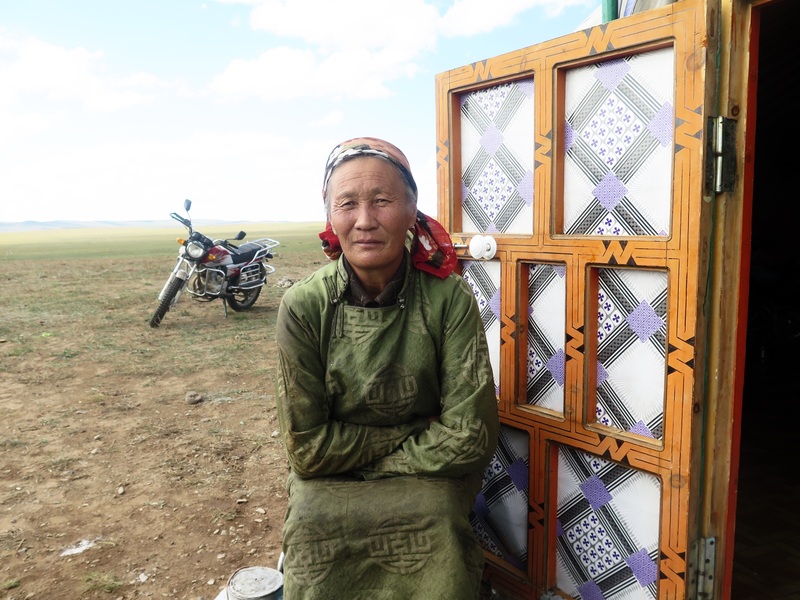 First, we didn’t quite understand why we were driving so far to find a nomad family. 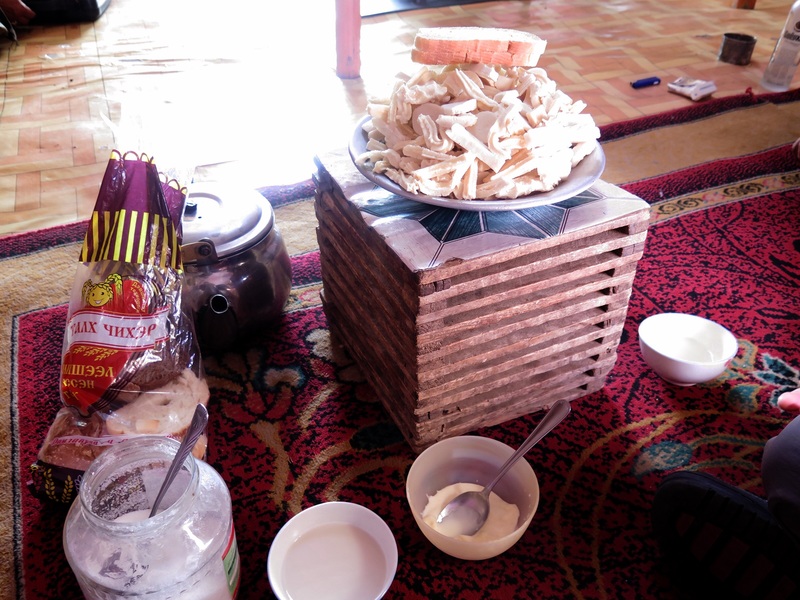 It was already considerably past lunchtime, and we knew we still had a long drive back to Ulaanbaatar. Why not just skip the family? The second thing was how completely unacceptable it would be to drive up to a random American home, knock on the door, and ask whoever answers if we could step inside and have lunch in their home. Can you imagine? We wouldn’t let anyone like that in unless it was seriously dire circumstances. But here’s what happend when Ogi spotted a ger and headed overland to pull up next to it. The ger we pulled up to. Steve and I glanced a bit nervously around and indicated that Meg and Ogi ought to take care of introductions while we stayed in the car. (I felt pretty awkward, and suspect Steve did as well.) 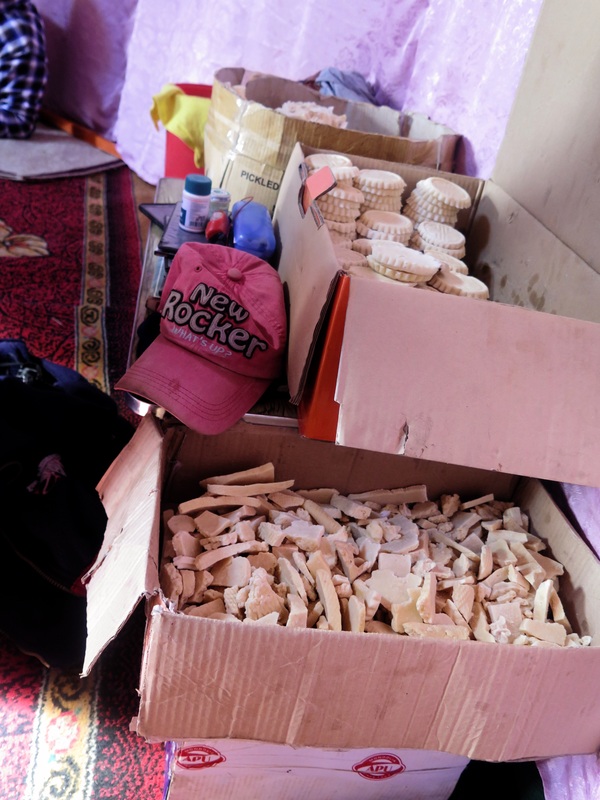 But the next thing we knew, we were out of the car and ushered into the ger, where they directed us to sit on a rug and brought us milk tea and these absolutely fabulous dried milk curd yogurt things. I have no idea what they’re really called, but they’re delicious. (I was given a huge bag of them when we left, and am willing to cart them with me through Russia even though they don’t fit in my suitcase.) We also got to try their sweet cream butter (I think that’s what Meg called it), which was divine and tasted like custard. So good. This is what we were presented with. In the small bowls, milk tea. The third and slightly larger small bowl is the sweet cream butter, and the big bowl on the stool is the yogurt cheese curd things. The milk tea: not my thing. If I am remembering correctly, milk tea is made from tea, hot water, milk, and salt. All but the last of those items make a grand beverage; add the salt and it just doesn’t work for me. All I taste (and I mean all I taste) is salt water. Steve, who professes not to like salt, enjoys the tea. I can only manage a few swallows so as not to be too rude. I really really want to like the milk tea, but I just don’t. More of the yogurt cheese curd things. I guess sometimes they sell these. Meg said it’s better when you get them from the nomads, because you know they’re not filled out with bread or grains; they’re the good stuff. Anyway, back to the nomads. The family was a woman and her three grown children. They were preparing to move, and had taken down one ger and packed most of their belongings into a truck. They didn’t plan to move until the following morning, but it was clear that their ger was unusually sparse. 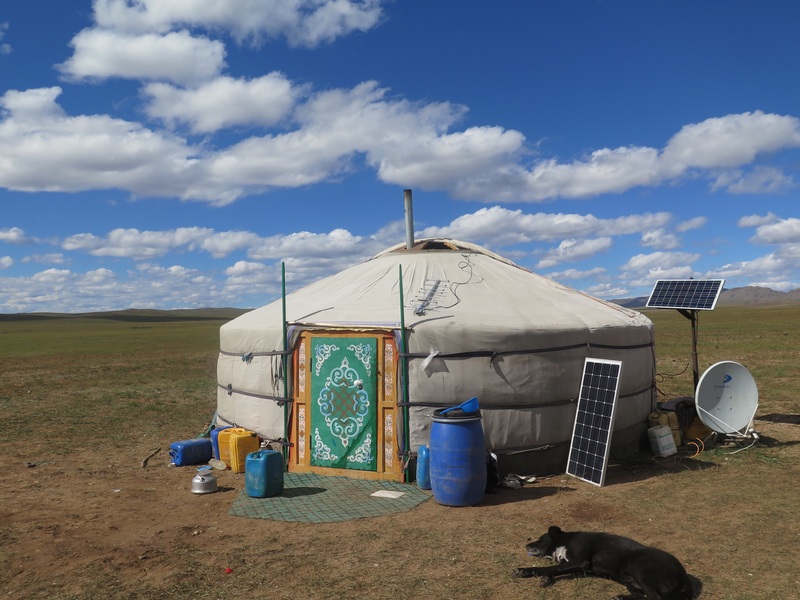 They told us that the new site would be about 70 kilometers away, and that it would only take a couple of days to move the livestock if they left early enough in the morning. The ger was more empty than others we’d seen, since the family was preparing to move. We took a few pictures. Meg cooked, and we ate lunch together. It was just…really nice. Absolutely worth the longer drive to find them. The painting detail on the roof and the doors (obviously not pictured) was really beautiful. This is typical of all the gers we were in. I never asked her name, but this was the mother of the family. When I asked to take her picture she said OK, but was regretful that she had on an old and dirty dress. And that was all. 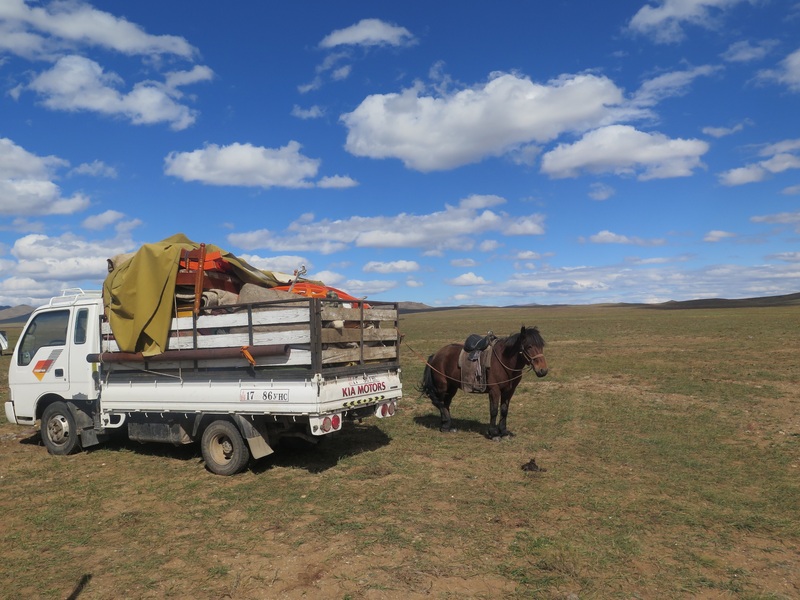 After lunch (which happend around 3:00), we got back in the truck and began the long drive to Ulaanbaatar. Our tour was over. Edited to add: Steve talks about the nomads in Ending the trek with a flourish. Also, after our return I found this interesting site that talks about gers and ger etiquette.